This project is ideal for ages 10 to 12 years of age. A ‘girder’ bridge is constructed from art straws and then tested by applying weights to the top surface. Consider pupils working in pairs, to build a bridge from art straws. The YouTube video below is a really good introduction to bridges and especially triangulation. Watch the video as a starter and follow it by questions. 1. What is a structure? 2. Name five world famous structures. 3. Name some local structures, perhaps even structures in the room where you are working. 4. A bicycle is made up of a number of individual structures. Draw a simple diagram of a bicycle and label the structures. The diagram opposite and photograph below show the shape and form of an art straw bridge. 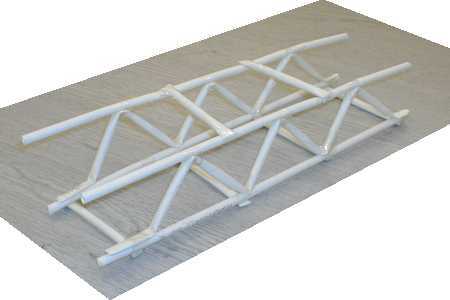 You are going to work through a number of simple practical exercises which will include making and testing the model bridge with weights. The model bridge shows good use of triangulation. Look closely at the diagram above and the photograph below. They clearly show the arrangement of triangles that make up the bridge. A triangle is a very strong shape and this is why it is often used the build structures such as bridges and many buildings. TESTING THE STRENGTH OF DIFFERENT SHAPES. Take an art straw and fold in into a triangle, then press/push it gently between your hands. You should be able to feel its strength even though it is made of paper/card. Do exactly the same again, but this time fold a second art straw into a square. Press/push it between your hands. You should find that it is not as strong as the triangle and that it collapses side to side. Experiment with different types of triangle or polygons. Test them by pressing/pushing them between your hands. You will probably find that an equilateral triangle is the strongest shape. The sides of an equilateral triangle are the same length.